In an effort to meet growing demand for gluten-free products and keep competitive, manufacturers are getting creative and delivering more variety, better textures, increased nutritional value, and, most of all, bigger tastes. Pamela’s Products is not alone. Thousands of food manufacturers, dietitians, professional chefs, and consumers are embracing gluten-free foods like never before. Thanks to advancements in product offerings, as well as improved taste, texture, and nutritional value, gluten-free foods offer something for everyone. As a result, the improvement in taste and the availability of gluten-free products has many people trying them, including those not following a gluten-free diet. “The variety and taste has been well received by all those on the diets, and the fact that there are many packaged products that can be easily prepared is a big incentive for those who don’t cook,” Marlisa Brown says. 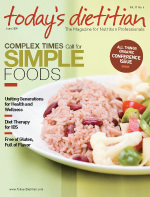 Steven Bager, vice president of JK Gourmet, finds that many manufacturers attempt to find a gluten-free equivalent to foods that already exist, thereby using ingredients that are no healthier than those in the original non–gluten-free food (eg, gluten-free cookies or pastries made with hydrogenated or trans fats or empty-calorie starches such as potato flour and rice flour). “We’d like to think that the tide is turning and that more manufacturers are beginning to think like we do,” Bager says. In fact, JK Gourmet has never looked at its products as gluten free. The company uses “whole foods”—heart-healthy nuts, seeds, fruits, and honey—to create baked goods that taste better than the original by not trying to mimic the original. From baby food to pizza to cake mixes, the gluten-free food categories are expanding as manufacturers continue to meet the needs of consumers on a gluten-free diet. Alicia Brown, MS, RD, CSSD, LD, corporate dietitian for United Supermarkets and Market Street food stores, has developed an entire initiative around gluten-free foods for United and Market Street shoppers. As Alicia Brown explains, gluten-free manufacturers were once limited to select flours: white rice, rice (ground superfine), tapioca, and potato starch flours. Today, the selection has expanded to include superfine brown rice flour, sorghum flour, bean flours, Montina, chestnut and other nut flours, coconut flour, mesquite flour, quinoa flour, and corn flour. “Some of the bean flours are not as popular because of the aftertaste and potential for abdominal cramps,” she says. Pastas have also come a long way. In fact, one of Market Street’s most popular gluten-free products is Tinkyáda Brown Rice pastas. “Our Market Street guests are thrilled to have palatable and tasty pasta to select and eat,” Alicia Brown says. Gums are becoming very popular, too. “Xanthan gum, for example, retains moisture, traps air, thickens, and has a high heat tolerance,” Alicia Brown says. “Sorghum is used to make ‘sweet’ products such as cake and cookies. With these ingredients, products are softer, lighter, and more flavorful.” Other gums include locust bean, guar, gum arabic, and carboxymethylcellulose. With so many gluten-free choices, consumers now have the power to determine which products thrive and which fall by the wayside. If a product isn’t of high quality and taste, the consumer has another shelf of products from which to choose. In addition to the experiences at Market Street, the Nutrition Business Journal and Packaged Facts have reported that 987 gluten-free products were introduced in the United States in 2008. “Research, and my experience with our customers, indicates this trend will continue,” Alicia Brown says. It is often discussed among the celiac community how a gluten-free diet is comprised of very refined grains and is therefore deficient in B vitamins, folic acid, iron, and fiber. As Marlisa Brown explains, many gluten-free products, especially those that don’t contain the variety of grains, are lower in nutrients and fiber and higher in calories and carbohydrates. For a long time, anything that was gluten free was acceptable, as the range of choices was very limited. “At the beginning, it didn’t matter whether a product tasted good or not—people settled for the fact that it was gluten free, period,” Bager says. Consumers are becoming more discerning now, with more manufacturers bringing gluten-free products to market with improved taste. With new developments in food science, the potential for gluten-free foods is limitless. Those living a gluten-free lifestyle can look forward to the quality of gluten-free foods improving each year. In fact, as Alicia Brown explains, “The market for gluten-free food and beverage products grew at a compound annual growth rate of 28% from 2004 to 2008, to finish with almost $1.6 billion in retail sales last year, according to market research publisher Packaged Facts in the brand-new report ‘The Gluten-Free Food and Beverage Market: Trends and Developments Worldwide, 2nd Edition.’ By 2012, the market is expected to reach about $2.6 billion in sales.